The Airbus A350 XWB is a medium-to-long-range, two-engined widebody jet airliner and it is Airbus's answer to the Boeing 787 Dreamliner. The aircraft also competes with the Boeing 777. The A350 XWB carries 250 to 350 passengers (in a three-class layout). After Boeing launched the 787 Dreamliner and sold this new aircraft well, Airbus initially answered with a proposal for an upgraded A330, with new engines as the most important innovation. But such an aircraft appeared hard to sell. Airbus had to do more. The next step, in 2004, was a design named "A350", an aircraft with a new wing, new engines and use of more composite materials than the A330 has, but still with a fuselage based on that of the A300 and A330. The proposed aircraft was intended as a competitor to both the Boeing 787-9, and 777-200ER. However, important potential customers like International Lease Finance Corporation (ILFC), GE Capital Aviation Services (GECAS) and Singapore Airlines were critical about the proposal. They preferred a clean-sheet design, especially including a new, wider fuselage. 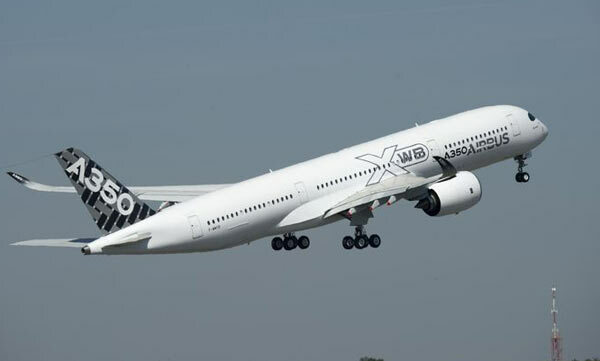 At the Farnborough Airshow 2006 Airbus presented a completely new design, named "A350 XWB" (eXtra-Wide-Body), with a wider fuselage offering eight-, nine- or even ten-abreast seating in economy class, depending on how much room an airline allows its passengers. The 787 can accommodate eight or nine passengers per row, the 777 nine or ten. The A350 cabin is 12.7 cm (5.0 in) wider than that of the 787 and 28 cm (11 in) narrower than in the Boeing 777. Airbus officially launched the A350 XWB on December 1, 2006. The company planned to develop three versions: the 250-seat A350-800, the 300-seat A350-900 and the A350-1000, seating around 350 passengers. The switch to the A350 XWB meant a lot of extra development work and higher costs. The intended in-service-date for the aircraft slipped from 2010 to 2013, more than four years behind the scheduled introduction into service of the 787. And Airbus needed even more time. The first flight of the A350, a 350-900, took place on 14 June 2013 from Toulouse-Blagnac Airport in France. 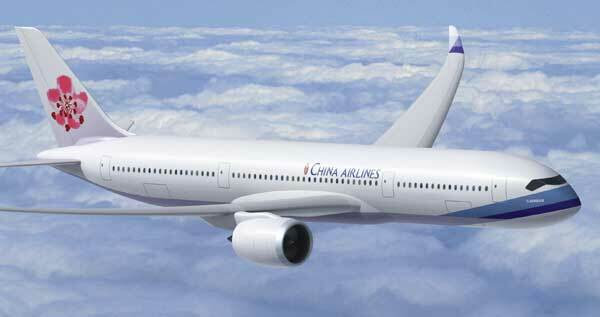 The new airliner is now scheduled to enter airline service with Qatar Airways in late 2014. According to Airbus the A350-900 is to become the cornerstone of the A350 XWB family. 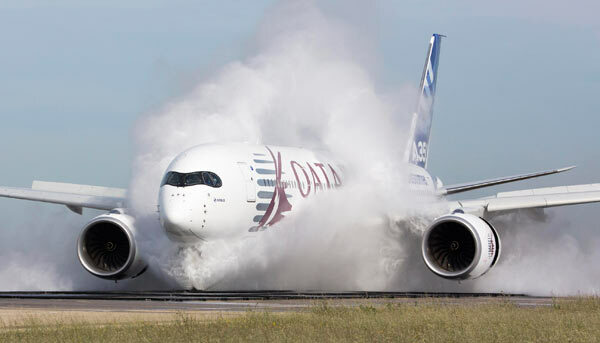 Aircraft of this version are to be delivered to launch customer Qatar Airways in late 2014. This aircraft seats 314 passengers in a thee-class layout. The A350-900 competes primarily with the Boeing 777-200ER and replaces the Airbus A340-300. It offers a range of up to 8,100 nmi (15,000 km). Planned - but not yet launched - sub-versions are the A350-900R with ultra long range, as a competitor to the Boeing 777-200LR, and a freighter, the A350-900F, to compete with the 777F. The A350-800, seating 270 passengers, was to become the smallest member of the new aircraft family, but lack of interest from the airlines and the launch of the A330neo makes it almost sure that this version will never be built. Airbus asked A350-800 customers to change their orders to the bigger -900 or the A330neo. The biggest version is the A350-1000, with 369 seats in a three-class layout and a range of 8,400 nm (15,600 km). The first delivery of this version is planned for 2017. The A350-1000 competes with the Boeing 777-300ER and replaces the Airbus A340-600. 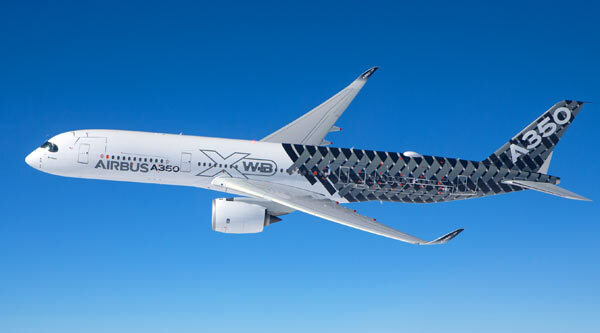 A possible version is a further stretch as "A350-1100" as an answer to the Boeing 777-9X. The A350 has a narrower fuselage than the 777 so that Airbus always needs a longer fuselage for the A350 than Boeing to offer the same seating capacity. An alternative for this market segment might therefore be an all-new Airbus widebody airliner, with a capacity in between the A350-1000 and the A380 megaliner. The A350 will give the passenger a flying experience compared to that of the Boeing 787. Like on the Dreamliner the cabin windows are larger. It also offers a better cabin atmosphere with 20 per cent humidity, a typical cabin altitude at or below 6,000 ft (1,800 m) and an airflow management system that adapts cabin airflow to passenger load with draught-free air circulation. More than 70 per cent of the A350 airframe consists of weight-saving advanced materials like carbon fibre reinforced plastics (CFRP, 53 per cent) and aluminium lithium alloys (19 per cent). In the A330 this is only 15 per cent. The new aircraft is the first Airbus product with an all-composite wing. The rear fuselage and the tail cone will be constructed from composites as well. An aluminium lithium alloy is used in the forward and aft sections of the fuselage. The third A350 test aicrcraft in flight. The A350 cockpit is a further development of the A350 flight deck and inherits many features common with other Airbus fly-by-wire aircraft. The aircraft has the same handling qualities as the A320, A330/A340 and A380 families, and is flown utilising similar operating procedures to reduce the need for training when Airbus-rated pilots transition from one type to another. The A350-cockpit has six large screens to present flight data to the pilots and it is also fitted with a head-up display. The flightdeck has a six-panel windscreen. Airbus considered a four-window arrangement in an earlier version of the design, but later chose for six. 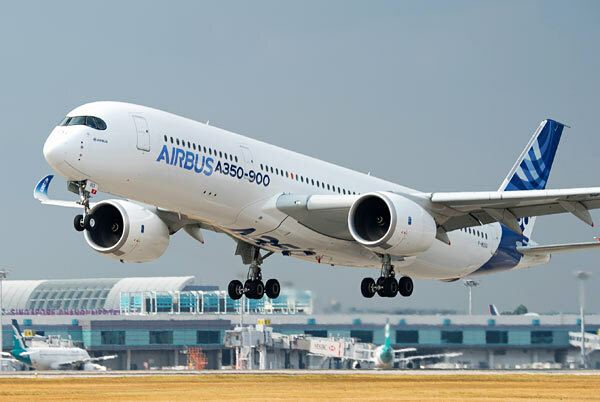 Airbus is aiming to certify the A350 with 350-minute ETOPS capability (= Extended range Twin Operationscapability; over long stretches of sea or desert after engine failure an aircraft is permitted to fly on one engine for 350 minutes to reach the nearest suitable airport) on entry into service and reach 420 min ETOPS capability later. The A350 is offered with Rolls-Royce Trent engines only. Airlines often prefer to have a choice, but that means extra development work airframe manufacturers increasingly prefer to avoid. The A350-1000 will be equipped with Trent XWB engines, optimised for the largest A350-version and with up to 97,000 lb takeoff thrust these will become the most powerful engines ever developed for an Airbus aircraft. Because of the problems with the lithium-ion batteries on the Boeing 787, Airbus decided to revert from Lithium-ion to nickel-cadmium technology. The A350 has an all-new composite wing with the same wingspan on all three variants. The wingspan of 64.8 m (213 ft) is 4.5 m (15 ft) greater than that of the A330 and the same as that of the longer range variants of the Boeing 777. The wing tips do not have winglets, but curve upwards over the final 4.4 metres (14 ft). The A350-1000 will have a wing with 4 per cent more area as the result of a trailing-edge extension. The A350-900 has four-wheel undercarriage bogies, like the 350-800 would have had. The heavier A350-900R and the A350-1000 will be fitted with six-wheel bogies, like the 777, and have a larger undercarriage bay. The new Airbus widebody is selling almost as well as the Boeing 787. In June 2014 Airbus had firm orders for 742 A350s. However this was down from 812 in late 2013 because of the cancellation of an order for 70 aircraft by Emirates, it promises a bright future for the newest Airbus product.